Jordan, a country which is sheltered from the troubles of the region, is safe to travel in and around, independently or in a group. The country is presenting itself to the European MICE audience with fully-detailed proposals as well as a complete specializing catalogue thanks to the cooperation of The Platinum Services, a Rome-based event agency and DMC specializing in first class events in Italy, Europe and other selected areas, and Guarantee Travel Group, one of the biggest DMCs and event and travel agencies of the Country, benefitting from personal contacts with Jordan Minister of Tourism and Antiquities Majd Mohammad Shweikeh. Jordan is located at the crossroads of three continents, making it an ideal meeting place for international events. Flying time from most European, African and Asian cities is around four hours, and there is easy and direct access from the USA and Canada. GMT +2 hours; US Eastern Standard Time +7 hours. Aqaba’s King Hussein International Airport (KHIA) is a gateway to the Red Sea and is becoming an important regional hub for business and leisure travelers. It is the only airport in Jordan to operate an Open Skies policy. The national carrier, Royal Jordanian Airlines, flies to 54 destinations and is a member of One World Alliance with code sharing alliances with many airlines. The country boasts a fine array of international hotels, with new investments constantly adding a number of exciting developments to the portfolio. The country is now embracing the concept of eco resorts and is increasingly supporting green initiatives. Besides the wealth of meeting space available in all the major hotels, the opening of the King Hussein Bin Talal Convention Center in 2006 on the shore of the Dead Sea signaled Jordan’s commitment to this sector. Jordan touches many senses – from spicy aromas and culinary pleasures to an invigorating mud wrap, first glimpse of Petra’s Treasury and the sound of desert silence. It is one of nature’s most unusual adventure playgrounds, containing some of the world’s best preserved Nabataean and Roman cities, as well as the Dead Sea, the lowest point in the world; and for an even greater adrenalin rush, it unveils the crags that tower over Wadi Rum or the waterfalls in Wadi Mujib. Click on the website for more information. Destination Seychelles will have a strong presence in the German capital, Berlin, as a 42 strong member delegation gets ready to attend the 53rd edition of Internationale Tourismus-Börse Berlin (ITB) travel trade show, which will take place from March 6, 2019 to March 10, 2019. Staged annually in Berlin, the ITB is the one of the world’s leading travel show and is a-must attend business-to-business event; providing a diverse range of destinations and industry sectors to Germany and international travel professionals. The show provides a unique opportunity for the entire global travel trade to meet, network, negotiate and conduct business. Destination Seychelles be featured alongside over 180 countries and some 10,000 companies and organisations, all fitted in 26 halls in the biggest marketplace of the international travel industry. The exotic and breath-taking paradise of Seychelles will have its own destination stand covering a space of 180sqm from which the delegation will be actively selling the charms of the destination during the four days of the fair. The Seychelles delegation will be headed by the Minister of Tourism, Civil Aviation, Ports & Marine, Mr. Didier Dogley, who will be accompanied by the Seychelles Tourism Board (STB) Chief Executive, Mrs. Sherin Francis, and will comprise of representatives from hotels, airlines and DMCs in Seychelles. The marketing wing of the Seychelles destination will be further represented by the presence at the Seychelles Stand of the Regional STB Director for Europe, Mrs. Bernadette Willemin, and the Director for Germany, Switzerland and Austria, Ms. Edith Hunzinger. Marketing Executive, Ms. Winnie Elisa and Senior E-Marketing Executive Randy Rosalie from headquarters will assist them all well equipped to sell the destination as one everyone deserves to tick off their personal bucket list. 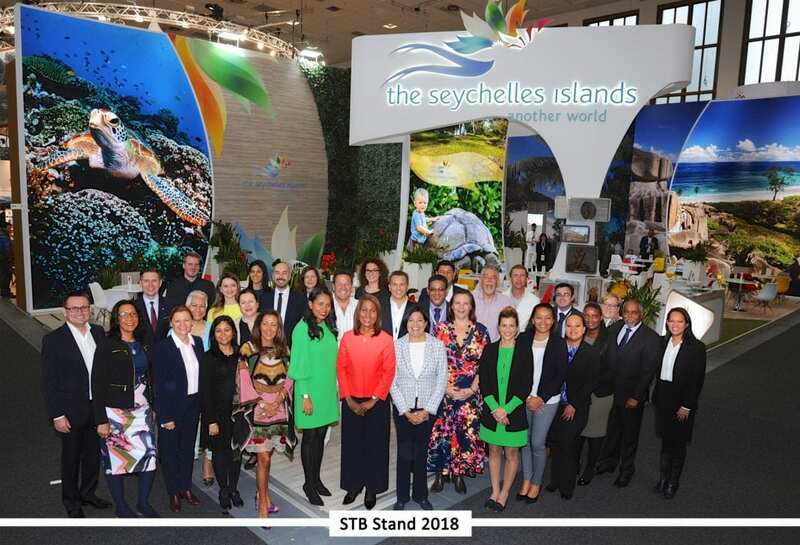 In anticipation of Seychelles’ presence once again in Berlin STB Chief Executive Mrs. Sherin Francis mentioned the importance of the destination’s attendance adding on to the visibility of the destination. “Seychelles presence in ITB is irrefutably some valuable exposure for the destination. Our selling tactic by attending major trade fairs as a tourism board is to make our destination as tangible as possible. We are look forward to marketing Seychelles means selling the destination ‘sea-sun-sand’ alongside our other features like our creole culture and hospitality. Our presence in major trade fairs adds on to the value of the experience and our partners”, said Mrs. Francis. Thousands of senior travel industry professionals, Government Ministers, and international press visit ITB each year in March to network negotiate and discover latest trends and industry opinions. Representatives of hotels include Mr. Fabrice Collot and Ms. Patricia de Mayer from Banyan Tree Seychelles, Ms. Wendy Tan of Berjaya Hotels Seychelles, Mrs. Foram Varsani from Cerf Island Resort and Ms. Ekaterina Gritsenko of Coral Strand Hotel and Savoy Seychelles Resort and Spa. Other tourism establishment representatives are Mr. Ash Behari from Coco De Mer Hotel & Black Parrot Suites, Mr. Alan Mason representing both Denis Private Island and Carana Beach & Indian Ocean Lodge, Mr. Manuel Policarpo and Ms. Rui Oliveira of Eden Bleu Hotel, as well as Mr. Anthony Smith, Mr. Andre Borg and Mr. Daniele Fabbri of Hilton Seychelles. Representing Kempinski Seychelles Resort & Spa will be Ms. Agata Sobczak and Mr. Masami Egami. Le Duc de Praslin and Valmer Resort will have a presence at the fair through Mr. Derek Savy and Mr. Robert Payet. Le Meridien Fisherman’s Cove will be represented by Mr. Marc Wozniak and Mrs. Jenny Seraphine. Other hotel representatives are Ms. Devi Sumayna Budhoo of Le Relax Management, Mr. Ferruccio Tirone and Ms. Samia Sedgwick of Maia Luxury Resorts & Spa and Paradise Sun, Mr. Eddie D’Offay of Pure Seychelles Hotels, Ms. Ernestina Bertarini and Ms. Sylvia Fletcher of Raffles Seychelles and Mr. Sherif El Mansoury from the H Resort Beau Vallon Beach Seychelles. Mr. Konrad Tarasiewicz from Coco Charter, and Mrs. Lucie Barone and Mr. Jonathan Loeffel will be representing VPM Yacht Charter Seychelles as DMCs. DMCs also include Mrs. Anna Butler Payette and Ms. Dorina Cedras of 7° South, Mr. Lenny Alvis and Mrs. Elza Frichot Dahoo from Mason’s Travel as well as Mr. Guillaume Albert, Mr. Eric Renard, Mr. Philippe Cornaille, Ms. Amanda Lang and Ms. Luisa Mehl from Creole Travel Services.